X-rays are a fantastic tool that allows us to see portions of your teeth that we otherwise wouldn’t be able to see at all. We are able to see between teeth, under the gums, and even look at the bone and ligament structures with X-rays. We are passionate about finding problems before they have a chance to become irreversible so that we can help you to prevent them altogether. Because we are so committed to the health of your teeth and gums we have adopted a new system of X-rays called digital X-rays. This system is faster and more powerful than traditional X-rays and gives us the added advantage of being able to educate you on what is happening in your mouth. We use X-rays to see things we normally would never be able to with the naked eye. We can see between teeth and into the different structures and faculties of the mouth using X-rays. 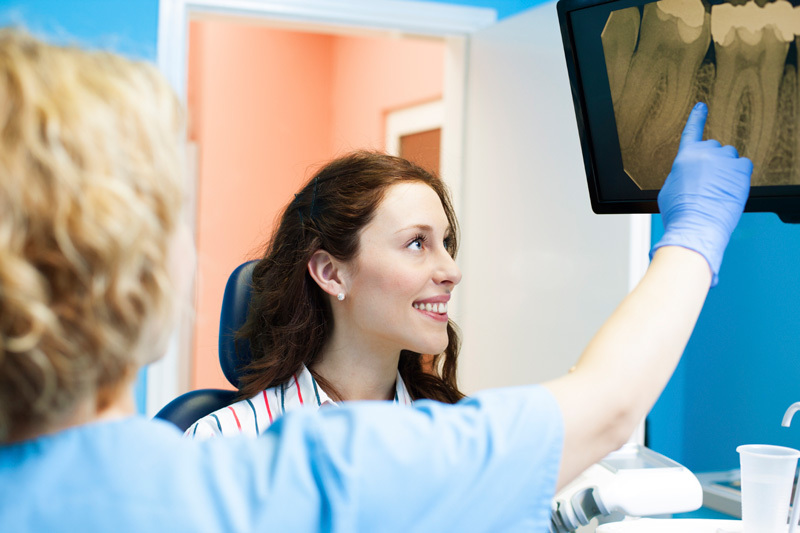 X-rays can even help us to spot areas where the enamel on your teeth is starting to wear thin. These areas are at higher risk for tooth decay, and with the advanced warning that X-rays give us we can alert you before a cavity even gets a chance to start. Digital X-rays have the added advantage of not having to be processed and developed the way traditional X-rays do. This allows us to share your X-rays with you immediately after taking them in beautiful high definition. By sharing with you the things that we see in your X-ray, you can take better care of your teeth in between visits to our office. Everyone knows that the best way to take care of your teeth is to brush at least twice a day and floss at least once a day. The part that a lot of people regularly forget is the twice-yearly trip to our office for an examination and professional cleaning. It's terribly important that you come in to be seen by us at least twice a year so that we can try to catch issues like cavities before they get too big to prevent. We usually only take one series of X-rays per year, so if you have already had X-rays done this year your visit probably won't start out with an X-ray. If you haven't had X-rays taken this year, we will begin your visit with that. We will have you put on a lead vest to protect you from radiation. The digital X-ray machine puts out only one fifth of the radiation that a traditional X-ray does, so there is absolutely no worry about radiation exposure. We will then have you bite on some X-ray strips and we will take a series of X-rays of your mouth. We will then be able to take you to the examination chair, where we can go over the X-rays with you and discuss any areas that we think might be an issue. Please call us today at (602) 842-4864 to schedule an appointment.